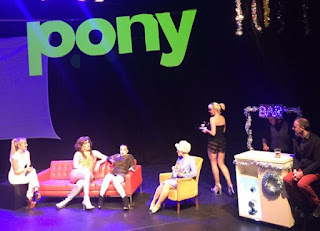 Pony Panto is legendary. A high energy music and dance sketch show, with comedic Christmas trimmings, lashings of kitsch and a loyal audience who squeeze in to catch its annual outing. For some in the MAC last night it was a massive ‘in joke’, recognising on stage characters from other performances and venues in Belfast. For others it was a chance to see their friends on stage freed from the constraint of a script. And this year with an extended run and huge demand for tickets, it was also full of brave newbies who scurried into the back seats in case what they’d heard about the front row was true. Leonie Pony compères commères the evening, well able to handle the banter of the cast and those in the stalls. With more costume changes than a Eurovision Song Contest presenter, the Sara Lund-inspired Christmas jumper dress with a dreadful polo neck deserves special mention. The stage is awash with characters including a juggling barman, a queen and Ireland’s pop-sensation Sinnead who has everyone singing along. House band Donal and the Drainpipes croon merrily accompany everything from their platform on the side of the upstairs MAC stage. The evening’s unwitting VIP is plucked from obscurity and positioned in a seat much closer to the action. 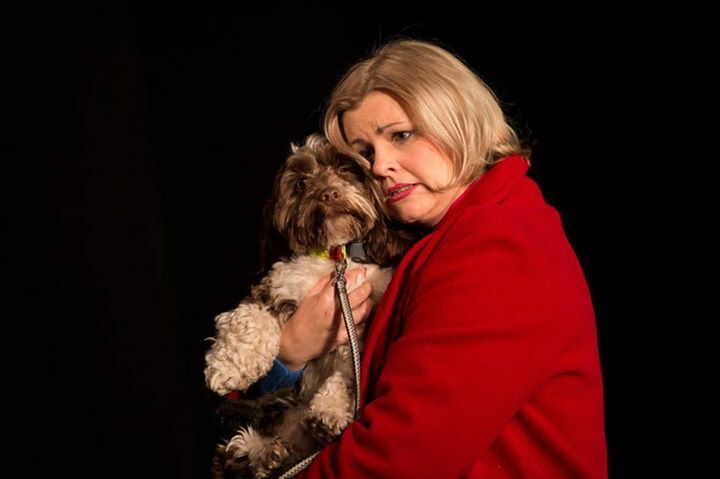 After the interval, Katie Richardson’s Hail Mary rap – “you wouldn’t have Christmas if it wasn’t for me” – ramps up the energy with a provocative yet reverent retelling of the Christmas story from the perspective of the young girl at its centre. 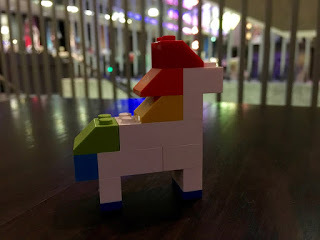 Pony Panto doesn’t take itself too seriously, yet it’s never slapdash. The Ponies throw themselves at routines with gusto and talent. The glum and apathetic mixed cheerleading squad are all the more funny with their sullen faces and lacklustre delivery of the routine. Finn’s ability to effortlessly shimmy high up a pole to scatter glitter over the acts below is only bettered by his breath-taking descents. There’s attention to detail: the regal powder blue dress could well feature at 3pm on Christmas Day. The merchandise on sale afterwards was popular and captures the spirit of the prance dance company. The snowflake Nutcracker ballet scene is beautiful and inventive (even after the Ponies mess with it). With a nine o’clock start in Cathedral Quarter, some of the Pony Panto audience had lost their inhibitions and there was affable heckling even before Leonie had pulled back the curtain to reveal this year’s stripped back extravaganza. The show finishes with a number that lifts the audience up onto their feet even if it’ll take a Stewards Enquiry to decide whether the man in the second row managed to string together the right moves in the right order. Going by its reputation, I expected I might raise an eyebrow at the content. Instead I found Pony Panto to be light and full of laughs, music, dance and a smattering of not too anxious audience participation. It’s obvious that the performers are enjoying the raucous show. 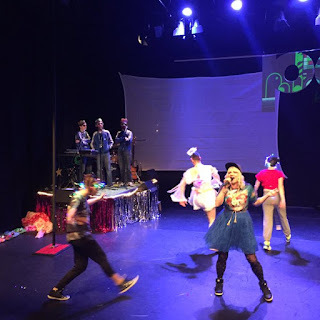 Pony Panto is new Belfast letting its hair down and having a good time. The challenge for the tracksuited Ponies will be to keep it niche and not go too mainstream. 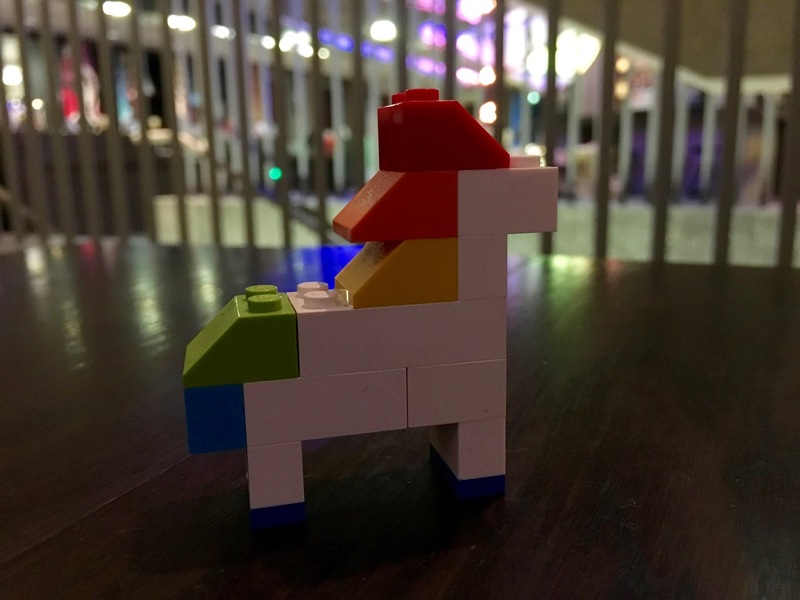 If you gee up and race to the (online) box office before the remaining tickets sell out, you can catch Pony Panto at the MAC until 19 December. 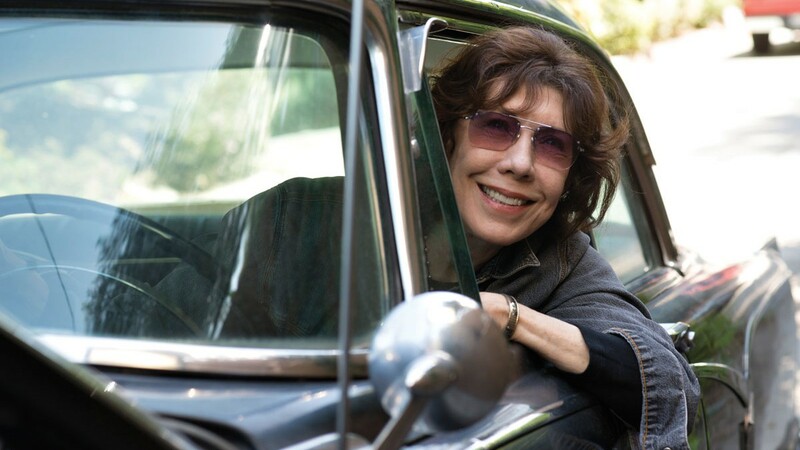 Like the feminist tomes that Elle (played by Lily Tomlin) tries to hawk to raise cash for her granddaughter’s abortion, the film Grandma is neatly split into chapters. Over six equal sections, we follow the strong-willed pair over a day as they hare about town attempting to call in loans and borrow funds from bridges that Elle burnt out (or blew up) long ago. Elle’s partner of thirty eight years Violet died eighteen months ago. The newer younger girlfriend is dismissed from Elle’s house and her life as “a footnote”. Up the hill comes a maudlin curly haired granddaughter Sage (Julia Garner) who has made a decision. With Elle’s credit card now swirling in the breeze as part of a wind chime, the petulant pair have barely a bean to their names. In simple terms this is an abortion road trip, though certainly not a film that glorifies or celebrates the heartbreak at its centre. Grandma nothing like Juno, but it doesn’t shirk from the “Am I going to hell?” doubts. She’s a grandmother who sure knows how to ask good questions, and holds no punches. But with young Sage reaching out – past her mother – for help, Elle jump starts Vi’s 1955 Dodge Royal with its heavy doors in a bid to find the cash before the medical appointment that’s already been booked for that evening. Underneath Elle’s misanthropic bluster and temper is a woman who cares deeply about the people around her, even those she seems to reject. Quite late on we meet Sage’s mother/Elle’s daughter (Marcia Gay Harden) in scenes that had the preview screening guffawing in laughter. By the film’s end we see three generations of women in the one family squaring up to each other. Each generation has lost a child. Out of tragedy perhaps there be some reconciliation and understanding. Grandma isn’t a neatly polished production. The only sequence where the camera is locked off and steady is when it’s attached to the side of the car. Otherwise, every shot jiggles and wobbles, sometimes even swinging around rather than smoothly panning or cutting to a different point of view. 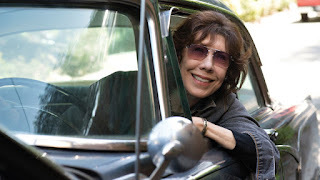 Just 79 minutes long, Paul Weitz’s low-budget Grandma is a good length. Nothing is rushed; nothing is padded. The story is told and then the film ends. Unsentimental yet light. Though gags about periods and condoms seem raw when faced with the serious backdrop of Sage’s decision. You can catch Grandma in the Queen’s Film Theatre between 11 and 17 December as well as some Moviehouse cinemas. Ahead of Tim Peake’s launch at 11.03am on Tuesday 15 December from the Baikonur cosmodrome in Kazakhstan and rendezvous with the International Space Station, I spoke to veteran European astronaut Jean-François Clervoy. He’ll be the special guest on Tuesday at W5 in Belfast as part of a day of events at the science centre and Armagh Planetarium with the UK Space Agency to mark the start of the Principia Mission and the first British astronaut in space for over twenty years. If you want to find out more about space nutrition and how space research affects local food production, find out how planes and rockets fly, as well as Jean-François Clervoy your own question, check out the details from W5 [PDF] and Armagh Planetarium. This year’s NI Science Festival (18-28 February) is themed around space technology and exploration and some events and tickets have already been launched. 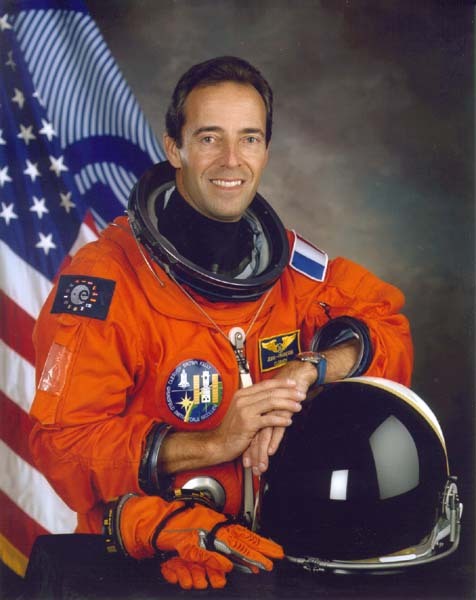 Jean-François Clervoy flew on three Space Shuttle Missions in the 1990s. I asked him what goes through an astronauts head in the days running up to a launch? The day of launch, usually you are full of serenity, you feel very at ease intellectually and mentally because you know that you’ve done everything that you had to do and you’re just thinking calmly about the extraordinary experience you’re going to have. So when it comes really close to walking to the rocket you feel excited because you’ve done everything you needed to do and you feel you’re ready – and people are telling you that you’re ready and the launcher is ready – and then when you sit in the capsule and you wait for the launch control centre to do the various checks then for ten to thirty minutes you have periods where you have nothing to do. Then you can let your mind float thinking about what you’re going to leave, thinking about your family. But you feel very serene because you are doing things that at this time of your life are just normal. You’ve been working on it for months. If just before going to the rocket someone tells you “sorry, we have to cancel the flight” or “we have to delay for one month because of a technical detail” then you would feel frustrated. Tim Peake will be docking with the International Space Station. On one of your three Shuttle trips, you docked with the Russian Mir Space Station and stayed for a week. What will be the first thing he notices when the airlock opens? He may likely feel a slightly different smell as the environment is not the same as in the Soyuz capsule … That will not be a disturbance that will attract his attention or priority. The first feeling is meeting humans in space that have been there for some time. You met them several months before during your training and you feel happy – it’s like a [reunion] of your family. You get so close to your crew mates because you know you’re going to share something so unique, so extra-terrestrial, so extraordinary that you build up family links between crew members. Joining with them in space is quite special because you know they’re happy to see you – “it’s nice to get visits” is what the Russians used to tell us when we went to Mir – and you know that you will be able to count on them to help you when it is your first flight. When Clervoy was in space, he was relatively isolated from family and friends, there to do a job for 7-10 days and then come home. There will be a lot of pressure on Tim Peake to be communicating about what he’s doing while he’s in space working. On the short duration missions even now the timeline of our agenda is so packed that we have only a chance once every week to do a real time Skype chat with family, but we have daily email synchronisation. On my missions [1994, 1997, 1999] we could do email. There were two or three synchronisations per day. From the [International] Space Station it’s almost like in the office in terms of connectivity. You can tweet, you can go through your email anytime, you can phone any phone number in the world starting by the country code, anytime, without receiving any bill! Some astronauts call their family every day for three minutes to [talk] about basic things; some prefer to wait once or twice a week for a longer period. But in terms of feeling connected with family, it’s not as restricted as before. I have friends from the ISS who were calling their family about a problem in the house, seeing if the plumber did the right job. In terms of isolation, I think Tim will not feel that. He will see the Earth and he will be able to communicate anytime he wants with the Earth – of course, anytime within his spare time – you have one minute here and there in-between different activities. Especially for Europeans who are from different member states of the European Space Agency they have some pressure to accept to do video conference with VIPs, with ministers, to report regularly, to use Twitter. It is relatively easy on a long duration space mission (six months) there is more free time. We know the rhythm that was imposed on the crews of the Space Shuttle is not acceptable for more than two or three weeks because you then get too tired. The number one priority for astronauts on long duration missions is to have enough sleep time! What about sleeping in zero gravity? Light sleep inducing pills are available if you’re still awake two hours after bedtime but most astronauts don’t take those pills for long. [Some astronauts] attach a pillow with a band to their forehead, keeping it pressing on the back of their head. It floats, which doesn’t help to rest the head – your head is at the same place whether you have a pillow or not – but they like to feel their head pressuring on the pillow. Sleeping bags are relatively comfortable now. You can attach it in the four corners with bungees or strings to anywhere. Personally I used to sleep on the ceiling. That was quite fun! Clervoy says that the ISS astronauts “don’t complain any more about the food”. Life is nice. On board, their weekends are free. There is some housekeeping to do at the weekends, and some astronauts dedicate their free time for optional outreach activities – they record videos for kids and schools – but they have seven hours of free time on Saturdays and Sundays because we try to mimic the typical work week on Earth. They exercise a lot, around one and a half hours a day dedicated to exercise, aerobic and anaerobic … Some come back from flight in better physical shape in terms of muscle than on the ground because they were not exercising that much before. But that’s quite rare: most of the time there is some atrophy of muscles. There is a variety of activity: work on the computer, work on scientific experiments, operational work with rendezvous docking, spacewalks, robotics, some leisure activity, listening to music, watching movies (they have hundreds of DVDs on board) but the most favourite activity of most astronauts is to look out the window, to look at the Earth, at the sky. This is probably what marks the life of an astronaut forever the most from spaceflight. The thing I will remember the most from my spaceflights at the end of my life will be the earth seen from space. Does that truly change your perspective on Earth when you return? Are astronauts different because you have seen the Earth from the outside … and you judge its problems and its crises differently because you’ve had that perspective? I don’t think a spaceflight changes who you are. It definitely changes your perspective on Earth, the way you think about the Earth because first you see it on the background of the deep blackness of the cosmos. You don’t see stars unless you do something to see the stars. I know astronauts who forgot to see stars from space! To see stars you need to be in an orientation where the Sun and the Earth are not in the field of view and switch off all the lights in the environment where you are in the space ship and let your eyes adapt and then it’s marvellous. The stars don’t twinkle and you perceive very well their colour. They’re very crisp. You see the colour of nebulae with your naked eye. It’s fantastic. When you look at the Earth it looks really unique, isolated, finite. When you see it with your own eyes it’s beautiful, you’ve tears in your eyes. Even if you are the most experienced commander like Matt Kowalski in the movie Gravity, three times in the movie you hear or you see the guy who has done it all – the commander who is over everything and this is his last mission – three times during the movie he says “Wow!” and the other one asks “What happened?” “You should see the moon reflecting on the Ganges over Nepal”. I’ve seen that. You see the Earth and you become like a child totally impressed by the beauty of the planet because it is beautiful, it’s contrasted, it is alive. And uniquely from space for the first time in your life from space the field of view carries your vision beyond 2,500km around. You see far around. And what you see in that field of view evolves very fast. After ten minutes it’s all different. You cross the whole field of view that you see in less than ten minutes. And what you see is beautiful. You see colours of phytoplankton blooming in the French Polynesia, you see glaciers, you see desserts, you see tropical forests, all this one minute after another. You go around in one and a half hours, so sixteen world tours a day. Every 45 minutes the sun sets or the sun rises. You see winter colours, all white, for 45 minutes when you fly over the north hemisphere, and the next 45 minutes you are above the south hemisphere where it’s the opposite season. Do you dream about looking out the window looking down at Earth? Oh yes. And I have plenty of movies and pictures from my flights. Sometimes I open my photo book and I look at that and I say “is this me who saw that in my life?” It is so extra-terrestrial in terms of sensorial experience that you feel it was in another life. You need to think concretely intellectually about it and the you remember, yes, it was me that did that. You have changes in your body, you see things that you’ve never seen before, you exchange with colleagues that you’ve never exchanged with before: it’s a totally different experience in terms of sensory, intellectual, and even spiritual experience. Clervoy admitted that he’d love to be the one returning to the ISS. He was party of the ‘jury’ that selected Tim (who scored the best marks in his training and beat the Americans in Nasa’s underwater expedition training exercise). “That guy, I would fly with him anytime in space, I would take him with me anytime in space”. High praise for the man who Clervoy describes as “the ideal astronaut”. 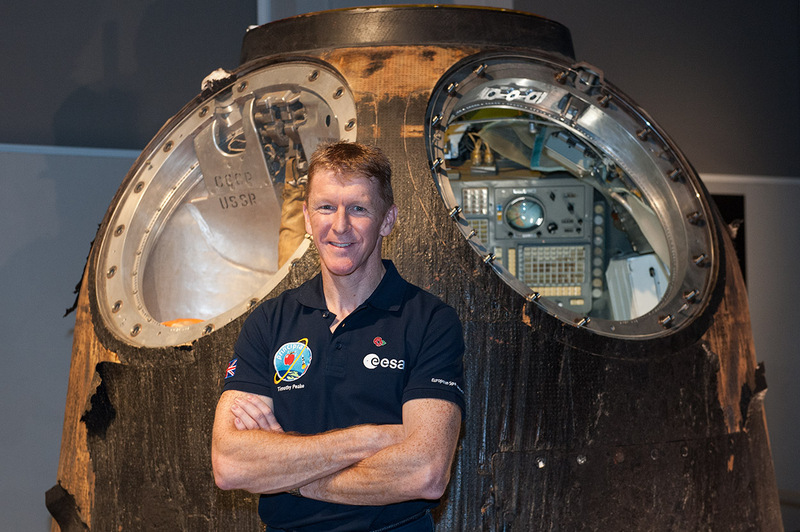 You can follow Tim Peake's progress on his blog, on Twitter @astro_timpeake and watch the launch and rendezvous/docking online. The fourth annual Northern Ireland Human Rights Festival runs this week between Sunday 6 and Saturday 12 December. The festival attempts to “challenge stereotypes about what rights and equality mean in Northern Ireland” and they hope the programme will “bring those conversations beyond traditional audiences into the wider consciousness of the people who live here”. Events looking at refugees form a thread running through the 2015 programme. There’s a daily lunchtime panel discussion looking at an aspect of human rights in the Black Box, and lots of films being screened. The full set of events is available on the NIHRF website. Below, I’ve selected a few highlights ... but don’t forget the Refugee Welcome Party on Saturday 12th. 7pm in Dublin Road Movie House – Free screening of Mary Meets Mohammad which looks at Tasmania’s first detention centre through the eyes of local Christian knitter Mary and Muslim Afghan Hazara asylum seeker Mohammad. You can reserve a free ticket. 8pm in Black Box – Screening of Open Bethlehem made by director Leila Sansour who returned to Bethlehem to make a film about her home town, soon to be encircled by a wall. She left the city as a teenager thinking that Bethlehem was too small and provincial. he film spans seven momentous years in the life of Bethlehem, revealing a city of astonishing beauty and political strife under occupation. £3. 1pm in UU Belfast Campus – Presentation drawing on artistic practices in Argentina, Rwanda and Bosnia to explore how communities and individuals use art to express experiences of human right violations and the place of art in seeking justice and engaging with contested pasts. 1pm in Black Box – Panel and discussion on the topic of Reproductive Healthcare is a Human Right. Free. 8pm in Aether & Echo – Songs of the People: Traditional and Contemporary Culture in Northern Ireland. Exploring cultural identity and today’s ethnic diversity through songs and stories from less traditional cultures. Presented by singer Dónal Kearney. £3. 6pm in the Black Box – Free discussion led by Disabled Police Officers Association and Disability Action about the treatment of police officers disabled while on duty during the Troubles (9000 were injured). 7pm at St Mary’s University College – Free lecture Dr Niamh Reilly (NUI Galway) on Women’s Human Rights: International and Local Experiences. 8pm in Black Box – Hollie McNish is a poet of whom fellow wordsmith Benjamin Zephaniah said “I can’t take my ears off her”. Tickets £10/£7. 12.30pm in Beanbag Cinema – Free screening of Departing: Arrivals – The Syrian Story, a film by Hafsah Naib about war, parenthood and survival. You can reserve a free ticket. 1pm in Black Box – A Round of Applause for my Glamorous Assistant promises a panel discussion to explore why girls tend to favour ‘the arts’ at school yet many creative careers are dominated by men. The panel includes women who’ve stepped into the spotlight. Free. 5pm in Black Box – Ulster Covenant, Easter Proclamation & Human Rights – An event to explore the human rights elements and meaning within these important historical and constitutional texts in our shared history. Free. 6pm in UU Belfast campus – Is Religion Fundamentally Anti-Choice? UU researchers Dr Fiona Bloomer and Dr Claire Pierson challenge the common assumption that religion is fundamentally opposed to abortion. By taking examples from comparative historical and contemporary religious perspectives, they’ll discuss whether political dialogue on abortion in Northern Ireland manipulates human rights and attempts to use religion as a barrier to women’s full citizenship. Free. 1pm at the Black Box – What Does Freedom of Assembly mean in NI? A panel discussion looking at Article 11 of the Human Rights Act, European Convention of Human Rights, the right to freedom of peaceful assembly and its current and potential impact on dealing with parading in Northern Ireland. Speakers Rev. Mervyn Gibson (Grand Orange Lodge), Neil Jarman (QUB), Brian Gormally (CAJ) and a representative of agencies dealing with parading. Free and lunch provided. 8pm in White’s Tavern –Inspired by Seamus Heaney’s poem From a Republic of Conscience, poets will share their work along with a poem on human rights that particularly inspires them. Free and with wine courtesy of Irish Pages. 1pm in the Black Box – A panel will the impact of the NI Human Rights Act and its long term future given current government plans to scrap the legislation. What has the Human Rights Act Ever Done for Us will have contributions from Brice Dickson (QUB), Claire Hanna (SDLP), Alastair Ross (DUP) and Kevin Hanratty (Human Rights Consortium). Free and lunch provided. 6.30pm in Waterstones (Fountain Street) – Marginal Theatre and Poetry NI present Phenomenal Woman: A Celebration of Maya Angelou with readings of Dr Angelou’s poetry and performance of music associated with this famous American civil rights activist and author. Free. 8pm in Sunflower Bar – Aidan Killian: Whistleblowers A passionate one-man show with intelligent comedy about standing up and speaking the truth. The truth will set you free… unless you’re Julian Assange, Chelsea Manning and Edward Snowden. £8/£5. 2pm in Black Box, Hill Street and Dark Horse – Refugee Welcome Party / Family Day. To close the festival there’s an opportunity to reach out to people who have had to leave most of their belongings, but more importantly their whole community, their friends, culture and history, behind. Show solidarity with the Refugee and Asylum Seeker Community and reach out the hand of friendship. Don’t bring supplies but bring yourselves and your family and join in the music, workshops, food, information and most importantly friendship. 8pm in Sunflower Bar – Refugee Welcome Party / Festival Closing Party. Free in to enjoy the live music in partnership with the West Against Racism Network as long as you’ve brought a present for the child of a refugee. 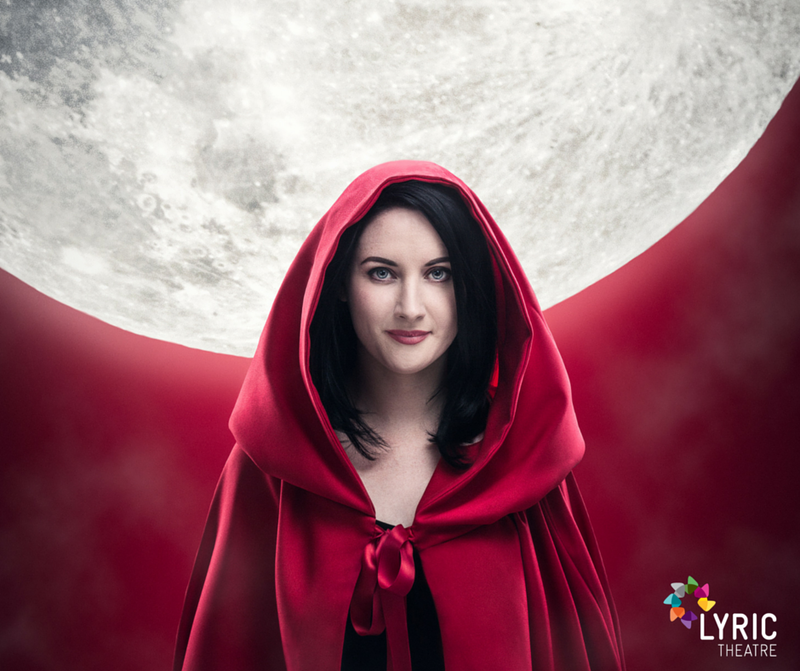 Children’s fairy tales can be very dark, and the Lyric’s version of Little Red Riding Hood & The Big Bad Wolf makes no attempt to water down the sinister elements of the story. 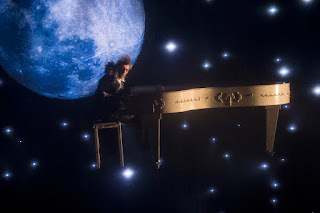 On top of the classical tale of a granny and girl eating wolf defeated by the woodsman’s axe are layers of edgy intrigue by writer Derek O’Connor, magical direction from Paul Bosco Mc Eneaney and beautiful music from the fingers of Ursula Burns. The first scene creates a visually strong start and I don’t want to spoil the surprise. But expect stars, the moon and a song from a piano that Elton John would covet during the opening number “I’m lonely as a wolf”. Very quickly audience involvement is sought as we become acquainted with the travelling troupe of Maestro family actors who tour around telling the story of Little Red Riding Hood. Christina Nelson and Frankie McCafferty play the “family first” Mum and Dad, helped out by twin sisters - “not identical!” - Rosie and Rachel. Practically-minded Rosie (Charlotte McCurry) looks after all the backstage production and feels under-appreciated while Rachel (Roisin Gallagher) takes the glory treading the boards. The tale takes a sinister twist when the real wolf appears and Rosie is lured into peril becoming the new Red. “I hate to tell you I’m going to eat you for my dinner” sings “Big Bad” (Kyron Bourke) with a suitably wild hairstyle that looks like a can of hair spray exploded over his bonce. The on stage music carries the story along and sets the mood for each scene. Along with saxophonist, drummer and lots of incidental percussion, Ursula Burns switches back and forth from keyboard to harp as well as singing. There’s nothing incidental: every ding and every clack is synchronised with the choreography of some on-screen action. The lyrics have lots of repetition and it’s not difficult for kids to follow. The cast’s voices are all strong and blend well. They’re also micced up well enough to carry over the constant accompaniment of sweet packet opening and children’s chatter. Early on as narrator, Charlotte McCurry talks, sings, plays percussion and flute. “One thing is constant, you need a bad wolf in the story” ... even if only to make children brush their teeth. But maybe the bad wolf can be stopped and turned into a bad-good wolf before wrecking anymore havoc and misery in the forest? Little Red Riding Hood & The Big Bad Wolf is a really ambitious production and the talented cast and team at the Lyric Theatre carry it off with aplomb. It’s a spectacular Christmas show and runs until 3 January. Your inner child really wants to see it! The Moore’s were celebrating Christmas early this year in Belfast. For the sake of their daughter, the estranged parents felt it would be good idea to show a united front. But with so much muddied water under the bridge and a wardrobe full of secrets, the turkey might want to hide under the table until the day is over. From the very beginning, All Through The House is full of laughs and very unexpected situations. 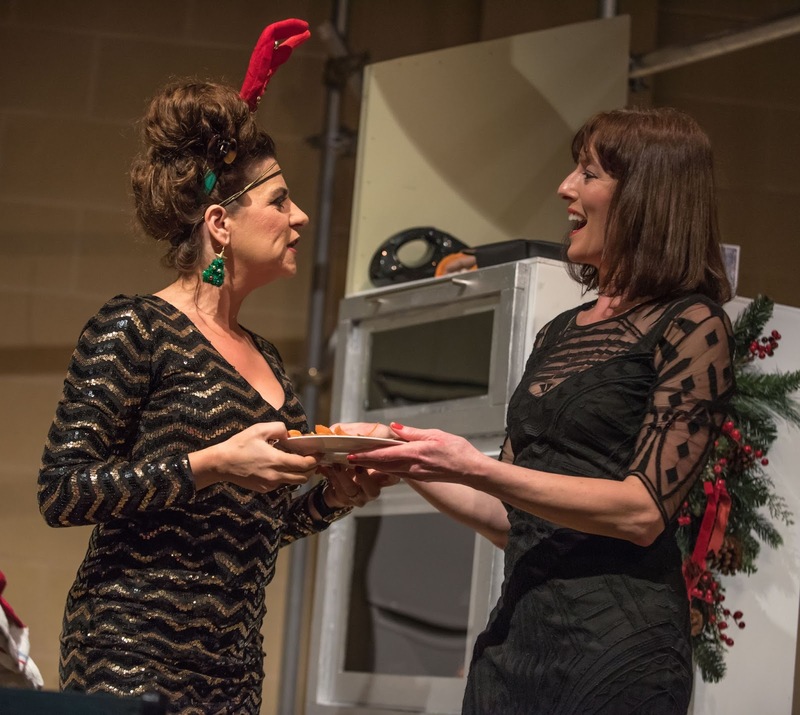 It’s hard to believe that this fast-paced farce is writer Judith King’s first full-length play. (She talked about the process of writing in an interview recorded last month.) And it's unlikely to be the last time we see new work from this playwright on stage. Straight-laced Carol (played by Mary Jordan) acts a world-renowned TV series Reign of Blood. When she’s not away filming in Poland she’s at home in the house she shares with her daughter. Ruth (Victoria Armstrong) is neurotic, with more than a shade of OCD. Coming to dinner are estranged husband Arthur (Stephen Beggs) along with his mistress turned steady partner Wendy (Maria Connolly). Arthur’s been topping up his tan ahead of a festive trip to the Canary Island and his face is pinker than his shirt. Wendy breezes into the house like a breath of … Storm Clodagh, followed by her mini-me daughter Pat (Bernadette Brown) who is an ex-best friend of Ruth. Later on another actor from the show Wolfe (Shaun Blaney) arrives out of the blue, more brawn that brains, and every woman in the house – eligible or not – throws herself at him. Everyone is on edge. Actors fear for their characters’ longevity. Business success eludes Arthur. Ruth has made a big mistake in work. Carol’s traditional dinner menu must not be ruined by Wendy’s “hat nibbles”. And there’s a whiff of unresolved love in the air. 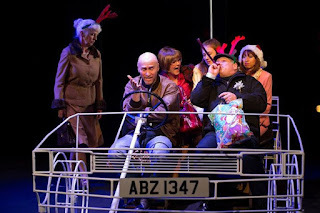 Director Patrick J O’Reilly has taken Judith King’s great script and created a firework show that does not disappoint. After the interval the action is briefly becalmed with lingering serious moments before Wendy storms back into action and pandemonium ensues. Emotions and relationships threaten to spin like a Catherine wheel, but even when Wendy finally explodes all over the dinner table, the display isn’t over. With no remaining elephants hidden in the room, the final Karaoke scene brings the show to a fitting conclusion. Stuart Marshall’s set uses scaffolding to give shape to the walls between the kitchen and the living room and frame the doorways. A garden bench creates an outdoor space into which characters can escape and earwig at the mumbled sounds of raised voices in the kitchen. (It’s an ambitious effect.) 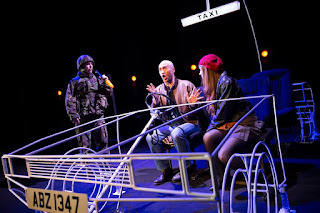 With all six characters on set for around two thirds of the production, the lighting keeps the audience focussed on the main action. There’s attention to detail with smoke pouring out of the oven and the turkey changing colour. 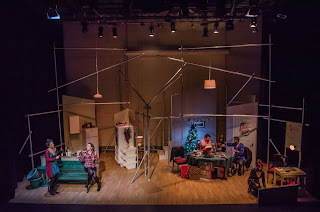 Strong performances across the ensemble cast create a fabulous scene of Christmas anguish. In particular, Victoria Armstrong’s portrayal of Ruth sets her out as the most likely heroine right from her earliest sleepwalking escapade in #Elfie pyjamas as the audience come to appreciate that she’s by no means the most mixed up adult in the house. 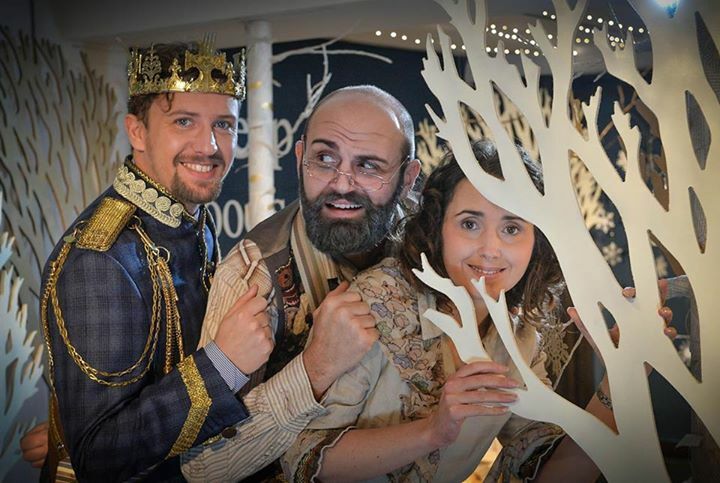 Tinderbox’s All Through the House is surely the Christmas show not to be missed this season. You’ll laugh out loud for a couple of hours, while your chest tightens with the stress of the on-stage shenanigans. It’ll certainly put most Christmas catastrophes in your house into perspective! With strong language throughout, it’s suitable for 14 years and above. 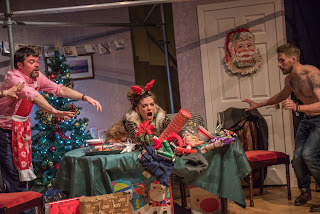 All Through The House runs in the Crescent Arts Centre until 19 December. Tickets £14 (£10 concession). Production photos by Neil Harrison. It’s like “real life acting out a soap”. 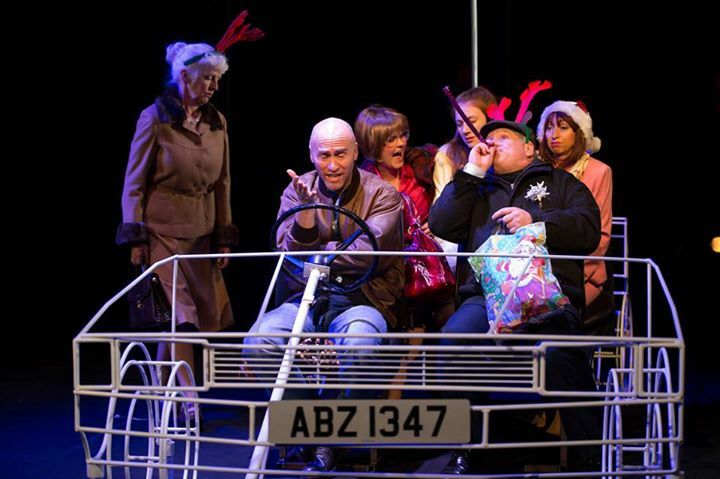 That’s how taxi driver Mackers (played by Tim Loane) sums up his annual Christmas Eve fares. 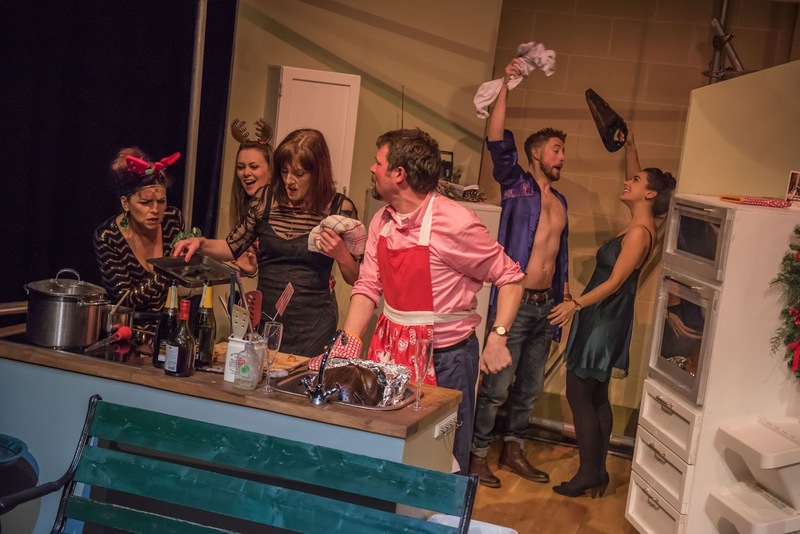 An ensemble cast of Julia Dearden, Dan Gordon, Jazzmin McClure, Matthew McElhinney, Tara Lynne O’Neill, Louise Parker and Katie Tumelty play more than twenty characters across the two hour play, with a few tight costume changes to manage. Set in 1992, it’s twenty years since Marie Jones’ play Christmas Eve Can Kill You was first performed, with Tim Loane and Dan Gordon reprising their original roles. This may be the last time the play can be performed before it truly becomes a museum piece. Mobile phones were still rare, with the first text message only sent on this day (3 December) in 1992. 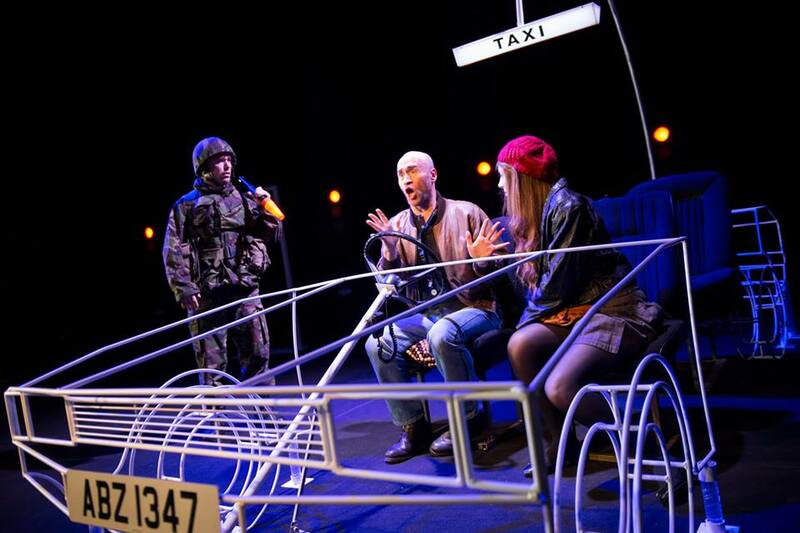 Young squaddies may no longer set up roadblocks on the streets of Belfast, Ford Sierras have become extinct, and it’s obvious from the play that inflation has hit the fares taxis charge, yet the tragedy and stresses of yuletide remain the same. Old people whose pride won’t allow them to admit they’re alone at Christmas, jealous mistresses, lotharios whose imagination is stronger than their pulling power, children estranged from their parents, and young fools in love. And who can fail to laugh at an English actor on a BBC taxi account who can’t pronounce Ormeau! Earlier characters reappear in increasingly unexpected and unconventional combinations as Marie Jones plaits the threads together. Her trick is to long withhold a key facet about each character and then suddenly drop it into the script to change how the audience view their motives. 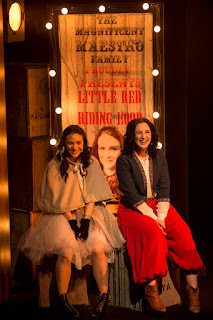 Tara Lynne O’Neill and Katie Tumelty are like the twins of the Lyric stage and slip comfortably into accents and characters that Marie Jones has gone on to develop in later plays. Louise Parker could tear strips off a book of ballot tickets with her tongue as she jumps between moods and emotions. Dan Gordon juggles being ridiculous, pathetic and vulnerable. While he’s far too young to remember it, Matthew McElhinney has the military red torch waving down to a tee. There are raised eyebrows and quick asides as well as lengthy monologues as Mackers leans forward and confides his thoughts with the audience, even when he’s driving. Laughter ripples across the auditorium. By the time we’d reached the interval, Wednesday night’s audience had begun to applaud those getting their comeuppance and hiss those who needed to wind their necks in. 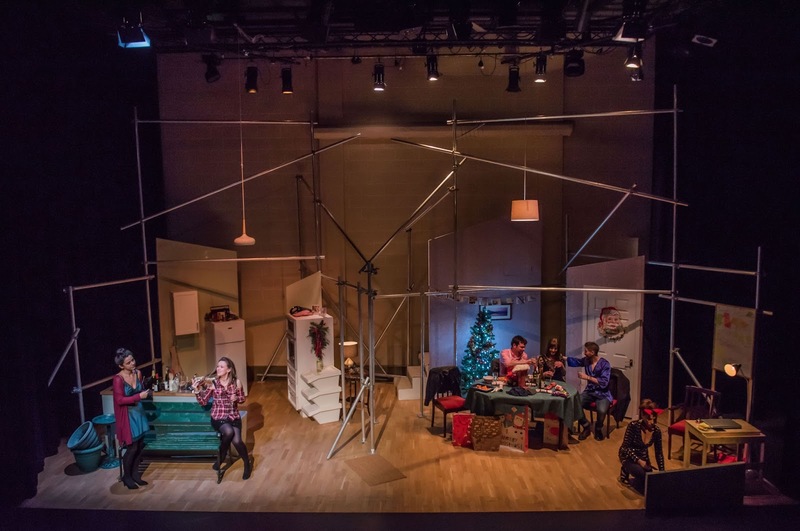 Theatre venues are challenged by the need for multiple shows to cohabit the same stage over Christmas. Lighting, set and sound designers double up across production to ensure a graceful fit. Other than a white door frame that most passengers step through onto the stage, the only fixed set on the all black stage is the white mesh outline of a car and a steering column. Five traffic lights flicker in the background as the car moves along the imaginary city streets picking up and dropping off fares. While the cue list must be endless, Garth McConaghie’s gentle sound effects when the taxi is moving make up for the lack of slammed car doors. If you see a taxi registration ABZ1347, go easy on him. He’ll already have had some actual back seat drivers tonight and while there’s a choice of music on the radio that suits every situation, you jump into the back of Mackers’ taxi if you dare. He’s all ears, but don’t be expecting him to laugh at your turkey jokes. 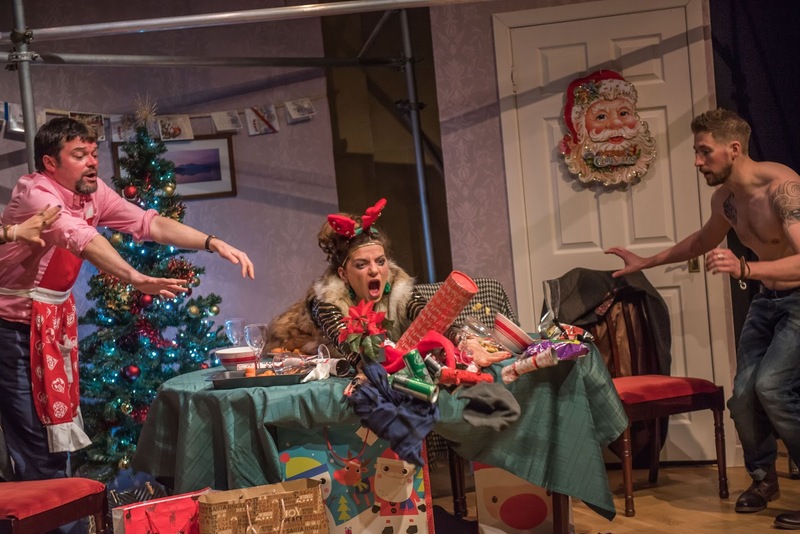 Christmas Eve Can Kill You runs at the Lyric Theatre until 10 January until 17 January (run extended). PS Did I mention the snow and the dog? If the Lyric sold stuffed dogs on the way out of the theatre, they’d make a fortune! 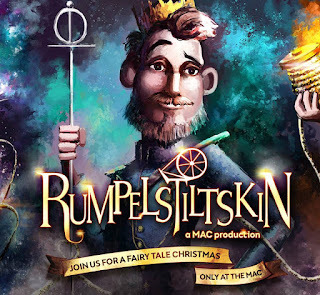 Rumpelstiltskin delights the main stage of The MAC this Christmas. First performed in the egg Theatre in Bath last year, Matt Harvey’s reimagined Grimm fairy tale is full of corny rhymes and set to music by Thomas Hewitt Jones. The show’s themes of fair treatment, weak leadership, hunger for power and austere times resonate with the economic situation Europe finds itself in. But it’s also a musical treat that anyone aged five or above can enjoy. “Life is hard running your kingdom” said the man who lacks imagination and relies on a chancellor of the exchequer an executioner to motivate his subjects to up their productivity and pay higher taxes. 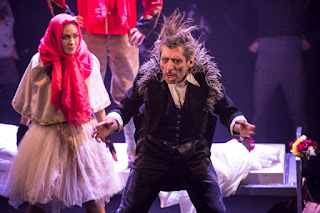 The Miller (Tom Giles) accidently oversells his hard working daughter’s spinning skills by telling the insolvent King (Michael Lavery) that she can spin straw into gold. Locked in a dungeon and faced with the impossible task of proving her father’s misplaced boast, Emily (Doireann McKenna) trades jewellery with a dark creature who saves her neck from the King’s threats. But as the bales of straw increase, she runs out of jewellery and has to sacrifice something much more precious to save herself one final time. The wedding vows are sign that Emily has both the one with a social conscience and the control in the regal relationship. Standing up to the King, she proves that there are better ways of making his their kingdom work. What other children’s Christmas show in Belfast will espouse social justice, human rights and gender equality directly in the lyrics of their songs?! After the interval, the plot bounces along in the shorter second half. The audience join in the quest to discover the creature’s name and free Emily from the terrible deal she made to save her own life. Doireann McKenna proves that she has a great head for names and allows her voice to soar beautifully above the men’s harmonies. Tom Giles also impresses with his mellow tone and some spirited Dad dancing. The relatively simple set is comprised of a raised walkway supported by wooden poles which allow the fiercesome creature (brought to life brilliantly by Jo Donnelly) to slide down to the action below. Michael Lavery makes a good cowardly King although his vocals are the weakest of the cast of four. A three piece band accompany live, perched high above the stage. In a couple of scenes the dialogue runs long and the youngest audience members’ attention started to wane though the cast are easily heard above any minor’s murmuring in the stalls and the audience participation is well judged and free of the rituals of pantomime. 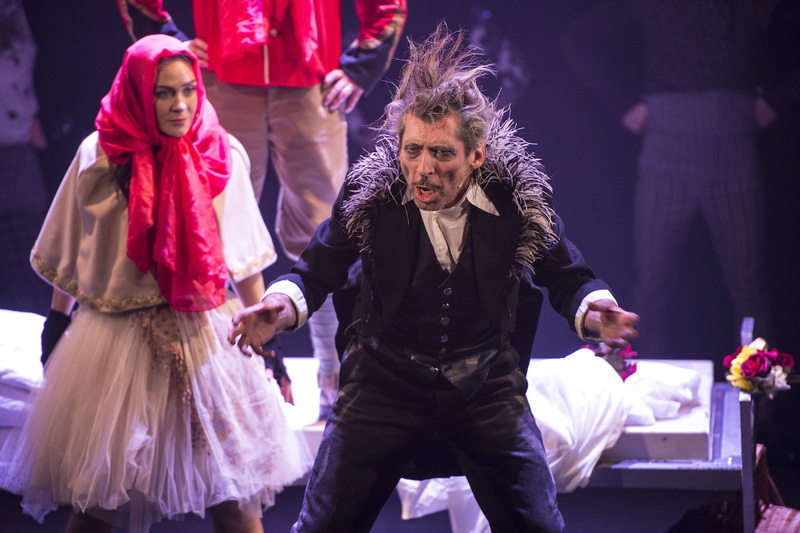 The final song neatly reprises the action and ends the performance with an energetic number that the youthful audience could continue to hum as they left the theatre and headed back home. My trio of young theatre patrons (aged 10-14, including two MAC first-timers) loved the show. 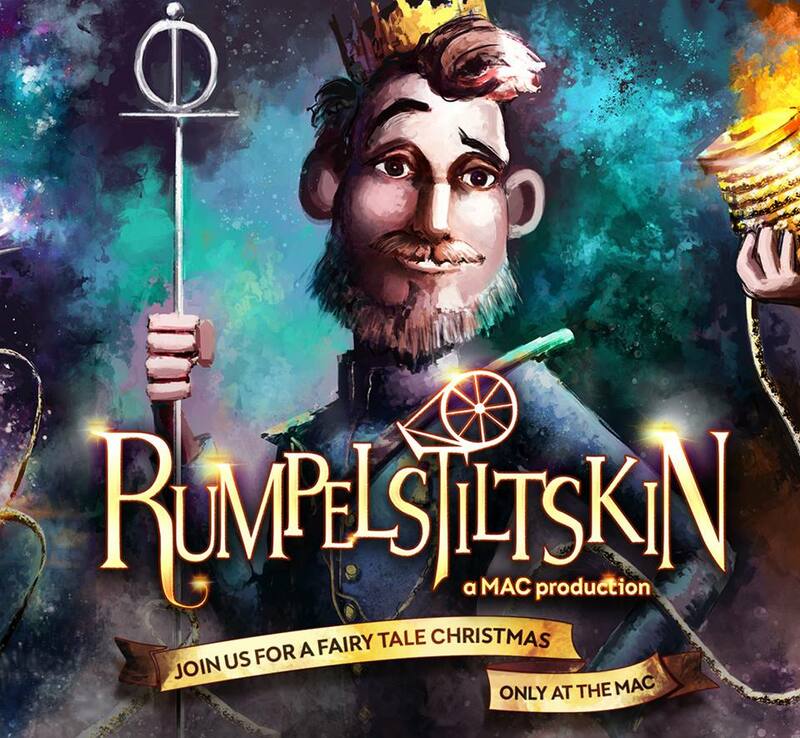 Rumpelstiltskin runs in The MAC until 3 January. Don’t forget its name!